Home › Dirty Politics › PAP’s track record, what track record? PAP’s track record, what track record? Askmelah’s Note: All these talks about track record are making people sick. PAP did not have much track record before it came into power. If the people then had asked for their track records PAP probably might stand little chance of ruling the country. People also did not vote the American president Obama into power based on his track record but rather the vision he articulated and the promises he made. Listen to the pod cast put together by celebrity blogger Mr. Brown, while hilarious, it does give a good rebuttal of the dumb “track record” talk. 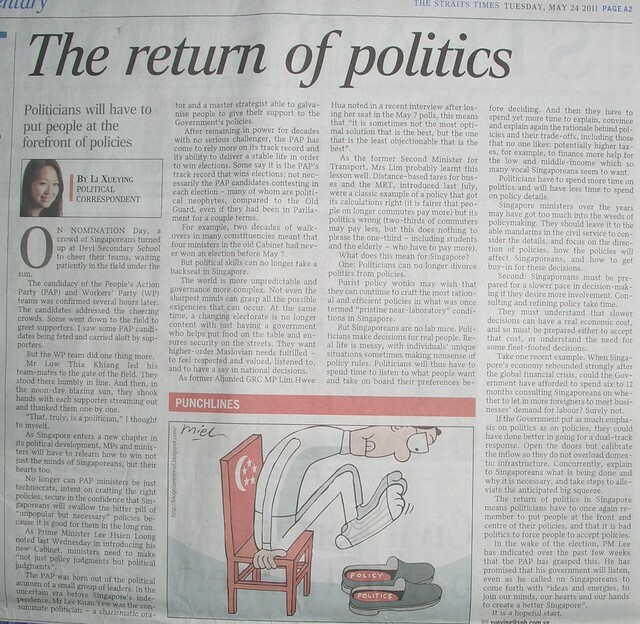 The Straits Times reporter Li XueYing (see article below) also rightly pointed out that PAP politicians should return to the roots of being politicians rather than staying aloof and being just brilliant technocrats. Leave the technicality and implementability to the civil servants, that’s what they are paid top dollars for, the politicians’ jobs are to consider the political implications to the people, nevermind the solutions sometimes may not be the best ones. As one forumer Amy Ng rightly pointed out “Come and sit down with us at the neighbourhood coffee shops more often to listen to us instead of just attending RC functions where things are so superficial.” It is time PAP looks for real politicians rather than CEOs, Generals, Scholars,lawyers and doctors to fill its ranks if it really wants the voters to stop looking for alternatives. Looks for people who wants to serve and able to connect with people rather than people with career achievements and academic results. Can current PAP Government claim credit for good works done by the founding fathers? Deputy Prime Minister Teo Chee Hean has cast doubts over the opposition parties’ manifestos, questioning if the parties can deliver on what they have promised. In comparison, he said the ruling People’s Action Party has a good track record and that its manifesto addresses practical issues of Singaporeans. He brushed aside criticisms that the PAP’s manifesto is lacking in substance. Mr Teo was speaking at the sidelines of the opening of NTUC FairPrice 100th store. Mr Teo added the election can be looked at as an event, but the excitement level should not be likened to a carnival or watching an action movie. Minister in Prime Minister’s office, Lim Hwee Hua added that the PAP’s manifesto gives an assurance to Singaporeans.